Starting an herbal business is challenging. When I decided I wanted to work on building my healing practice full-time and focus on creating healing herbal compounds for people, I did not know what it would be like or how much work I would be doing. Now that the holiday rush is over, I want to think more strategically about how to market my products, how to build my clientele and, quite honestly, how to make a living. I set up a GOFUND me account that would help with the costs of running a business, things like insurance, packaging, advertising, supplies and other business expenses. There are so many little (and big) costs when you begin any business, I think at some point, anyone would ask "why do it?" For me, the answer is always this - helping others find healing is worth it, and helping someone feel less pain is worth it. There might be some struggles along the way, but knowing that I am able to help my grandma move around more because she doesn't feel the sting of her arthritis when she gets up, my struggles are small in comparison. I am working on a new Winter Care Puppy Salve - because our four-legged friends need skin care too! 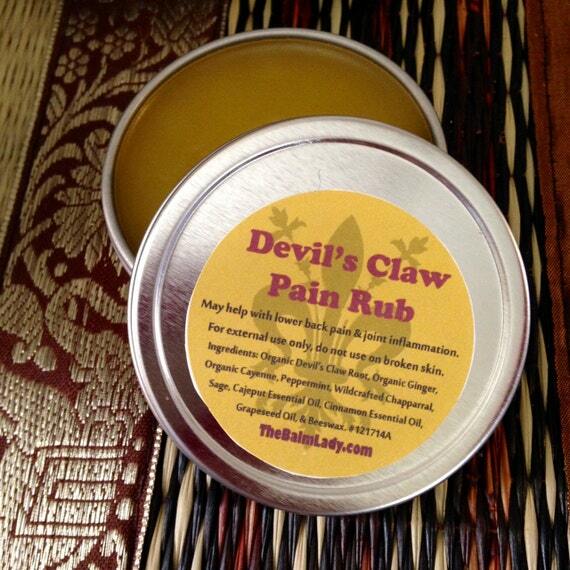 Update on Devil's Claw - I now have a nice rub, which I made using Organic ginger, organic cinnamon, peppermint, wild-crafted chaparral, sage and cinnamon and cajeput organic essential oils, grapeseed oil, and beeswax. It works pretty well, test it out here.